The boy and the Berlin Cathedral. It had been a hectic week at ITB Berlin, the world’s largest tourism trade fair, which I visit every year. I didn’t get to see much of Berlin on my previous visits so this year, I decided to add on a weekend to explore the city. My partner joined me for these few days. 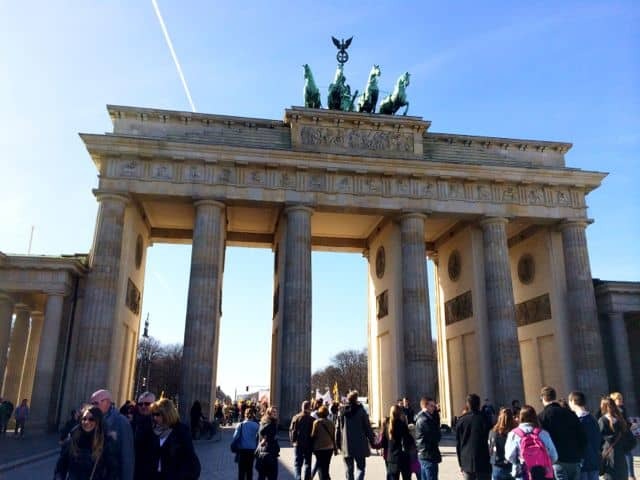 We’d seen the major highlights of Berlin like the Reichstag (Parliament), the museums on the Museum island, the Berlin Wall, the Brandenburg Gate and Checkpoint Charlie on previous trips so we decided to simply wander around the city and see where we ended up. It turned out to be a fantastic weekend in this truly incredible city. We started our Saturday morning with breakfast at the ubercool 25Hours Bikini Hotel, with a terrific view of the Berlin Zoo. We poured over our map as we munched on freshly baked croissants. There’s so much to see and do in Berlin that it was hard to agree where to start and where to go. We thought of a bike tour, a tour in an old Trabant car (!) and even a ‘secret’ food tour! After much debating, we decided to start our stroll at the Potsdamer Platz, an easy compromise due to its central location. This historic square, once the busiest traffic intersection in continental Europe, suffered extensive damage during World War II and was later split through its middle by the Berlin Wall. These days, it’s a bustling place lined by modern buildings including the futuristic Sony Centre. 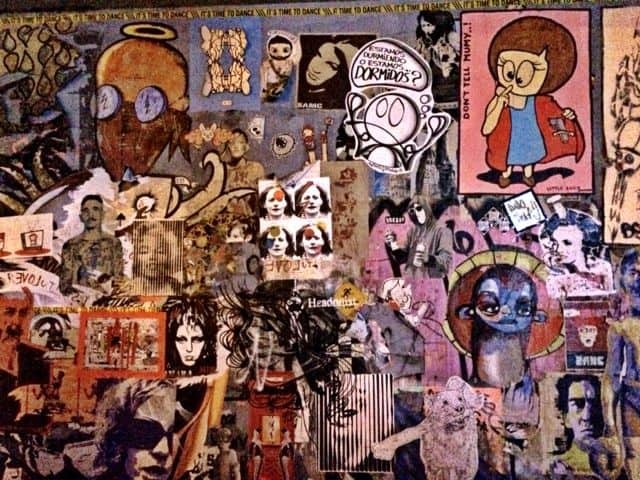 Several original pieces of the Berlin Wall stand here as a chilling reminder of the city’s tempestuous history. Piece of the Berlin Wall at the Potsdamerplatz. From here, we strolled down Ebertstrasse towards the Brandenburg Gate, passing the Memorial to Homosexuals Persecuted under the Nazis and the Holocaust Memorial. 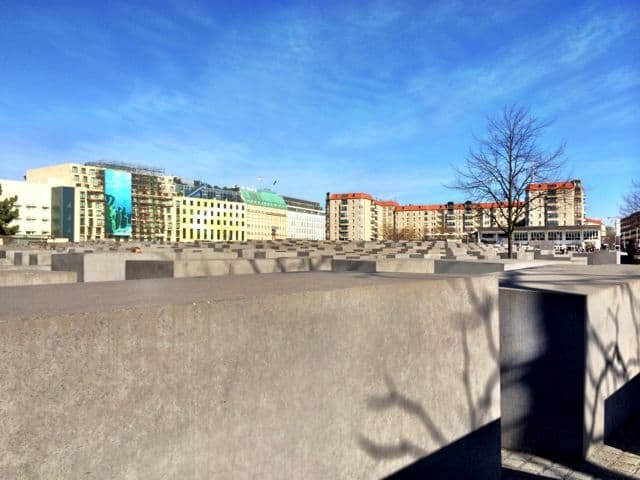 The Holocaust Memorial, with its rows of bold, grey concrete blocks of varying heights, is simply extraordinary. It invites people to playfully explore its maze of hilly alleys between the concrete blocks but wherever you go, the gravity of the Holocaust never leaves you. It’s an emotional, uplifting yet sober experience all at once. 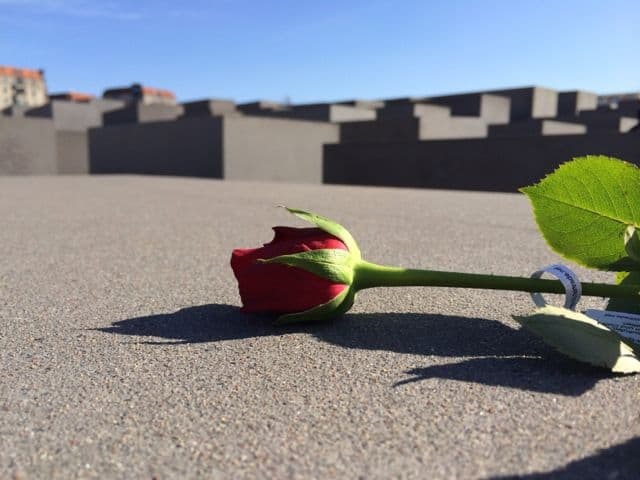 A single rose at the Holocaust Memorial. We continued our stroll to the iconic Brandenburg Gate and down the Unter den Linden avenue before turning left at the Friedrichstrasse, a shopping street. 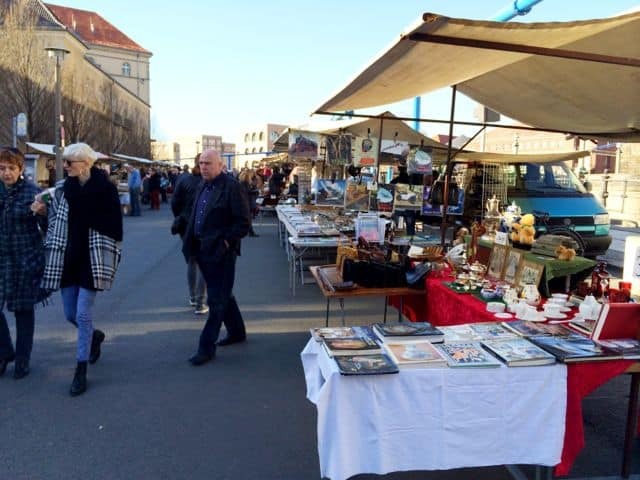 We slowly made our way towards the Museum Island and walked along the Spree River promenade where we stumbled upon an open-air flea market. It was a beautiful sunny day and the market was a magnet for visitors and locals alike. We then crossed a bridge at the world-famous Bode Museum and continued through the Monbijou Park along the banks of the Spree towards Alexanderplatz. 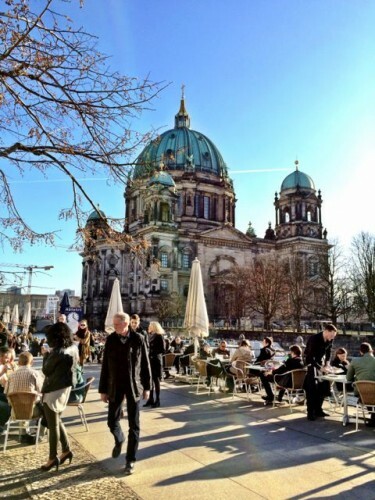 It was very cool to see Berliners enjoying the fabulous weather, lying on the grass or lounging in chairs with friends, family, some wine, beer and grub. We stopped at a terrace for a beer and totally enjoyed watching the people pass by. 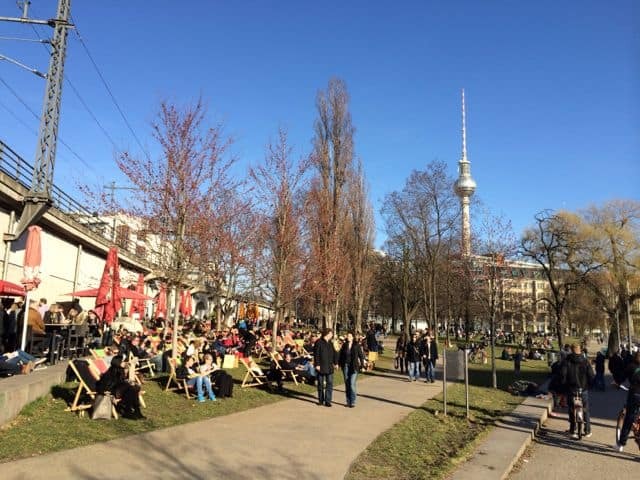 Berliners enjoying the sunny weather! Terraces along the Spree River with a view of the Berlin Cathedral. We walked past the Berliner Dom (Cathedral) and the Fernsehturm (Berlin TV Tower) – we’d already been into the Cathedral and the tower before so we decided to skip it this time; but I can definitely recommend a visit to these two attractions. We continued along the Karl Marx Allee, with its impressive Marxist architecture before hopping onto the U-Bahn that took us to the Friedrichshain district. We’d never been to this district before and we were in for a fabulous surprise! We got off at the Samariterstrasse station and criss-crossed the neighbourhood from here. My first impression of the district was that it looked rather rundown but as we approached its centre around Boxhagenerplatz, we discovered its edgy, artistic side. Colourful murals and street art adorned the façades of buildings, and the multitude of cafés, restaurants and shops added to the vibrant ambiance. We loved it and spent the rest of the evening here for drinks and dinner. 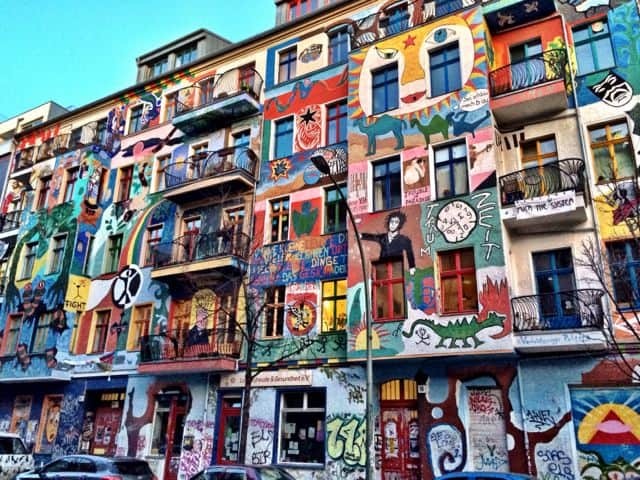 Colourful murals adorn these buildings in the Kreutzigerstrasse in Friedrichshain. Fabulous street art in Friedrichshain. I could spend a long time just admiring the details on this wall! By the way, if you love street art, you have to check out the legendary East Side Gallery, which is within walking distance of Friedrichshain. 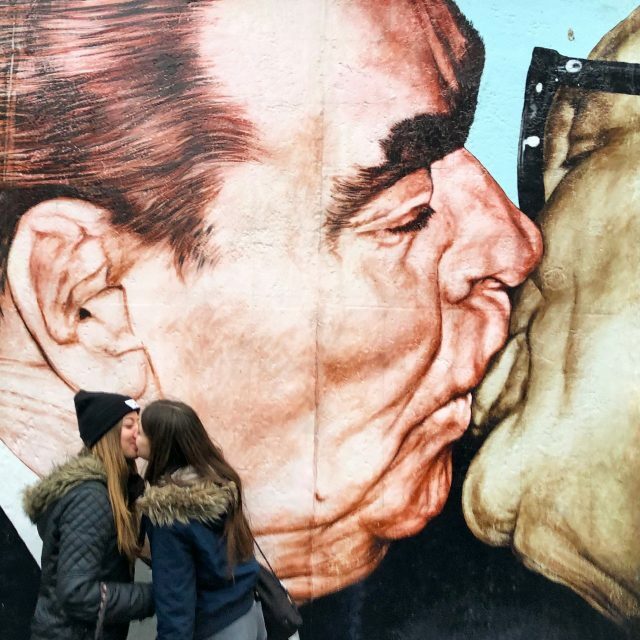 One of the world’s most famous pieces “The Kiss”, depicting East German leader Erich Honecker and his Soviet counterpart Leonid Brezhnev in a passionate kiss, can be found here. The Kiss at the East Side Gallery. The sun shone brightly the next morning – another beautiful day! 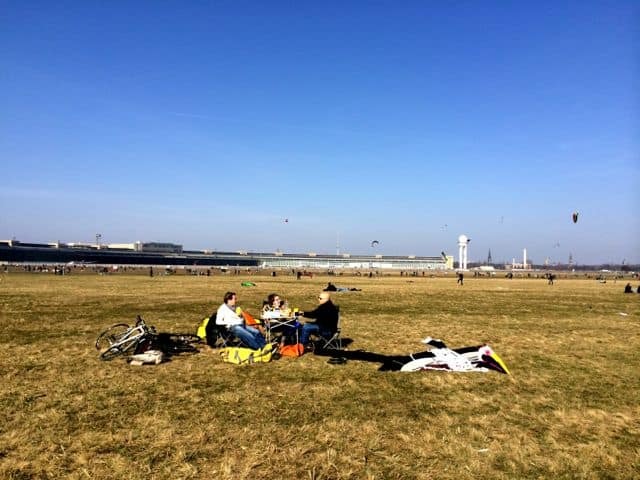 “If the weather is great, head out to the old Tempelhof Airport”. I’d heard this tip many times before so off we went to see for ourselves what it was all about. The Tempelhof Airport was the site of the infamous Berlin Airlift that provided West Berlin a crucial lifeline after the Soviets closed all traffic by land and water in 1948. In 2008, the airport was closed to commercial air traffic after a lengthy debate and a referendum. The airport was then used for fairs, concerts and exhibitions before being officially turned into a city park, Berlin’s largest. 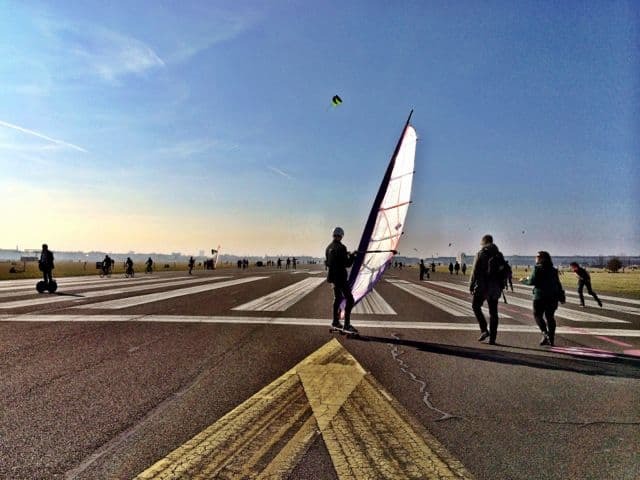 We arrived at the site to find thousands of people scattered around the expansive tarmac and runways, simply enjoying the sunny Sunday morning. The atmosphere was incredibly relaxed, with people picnicking on the grass or flying their kites. It was a windy day and the kite-flyers were out in full force. On the tarmac and runways, people jogged, cycled, rode Segways, scooters, kite-surfed (on skateboards) and para-sailed (on skateboards too). It was an incredible sight! We wanted to hire a pair of Segways but they were all taken so we got ourselves some electric scooters instead. It was so much fun zooming down the runways dodging skaters, cyclists, joggers and kite-surfers, and feeling the wind in my face. 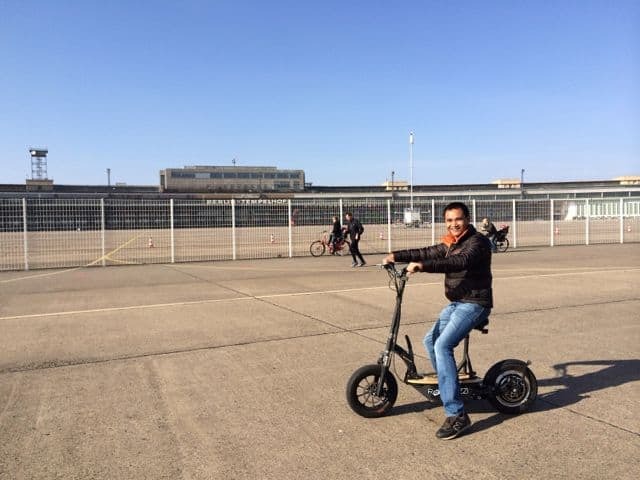 The fact that we were riding a scooter on a broad runway added to the thrill! Me on my electric scooter! Needless to say, we had an unforgettable weekend in Berlin, arguably one of the coolest cities on the planet! It really has everything I look for in a city: a relaxed, edgy vibe; striking architecture; a vibrant cultural and culinary scene; and people so friendly, they would stop unasked to offer assistance if they noticed you were in need. I LOVE BERLIN! One tip: if you’re visiting Berlin for a few days, check out the Berlin WelcomeCard, which covers public transport and offers discounts on tickets to museums/attractions as well as restaurants. Look for tours in Berlin. As mentioned above, I stayed at the cool 25Hours Bikini Berlin Hotel, which I can definitely recommend! 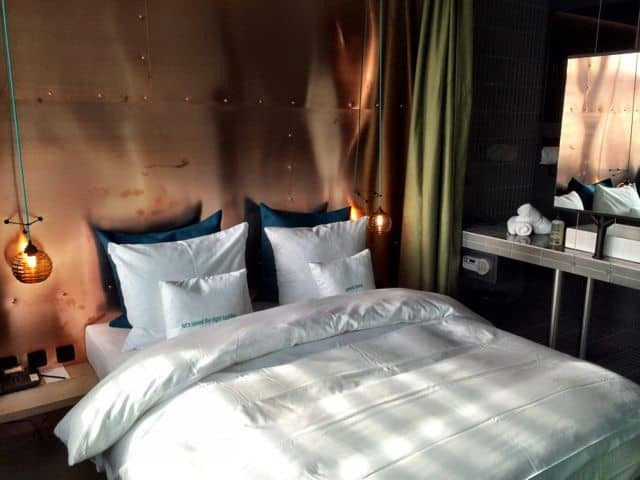 Read my review of the 25Hours Bikini Berlin or check the hotel rates. I love this city too !!! 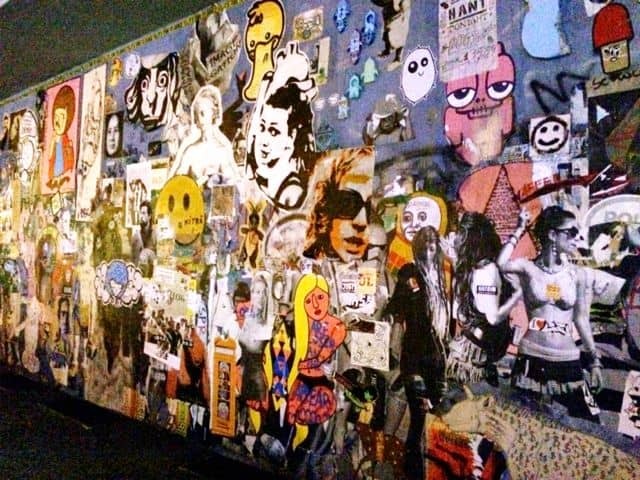 @Becki: yes, the streetart has been there for a long time. 😉 there are guided streetart tours if you don’t want to miss out on the good stuff next time you visit! I was also surprised at how friendly Berliners are during our recent trip there for ITB. I went to Berlin expecting everyone to be cold and stoic, but they were just the opposite. The city definitely has a lot to offer and I fell in love with its architecture. That’s an awfully nice weather during your visit! Sunny days in March are a rarity if history’s anything to go by! Man oh man, Berlin is so bloody cool … I just have to get there and base myself in this vibrant city! That only means one thing… you have to go back! Hehe! 🙂 Thanks for your comment Andi! Oh my I love the colorful buildings! I’m sad I missed that on my trip in November.